SteamPunk Glass: I'm at Greenwich! Last week was momentous! After a lot of work, I have been accepted to trade on weekends at Greenwich Craft and art market, so it's all systems go! I'd have blogged sooner, but I've been in Greenwich nearly the entire week until now! Wednesday was a chance to test out some new stall displays, and get feedback from the market managers. I was delighted (and somewhat pleasantly stunned) when they said I could come back and trade any day! I returned on Friday, there were a lot more stalls, however it was bitterly cold and instead of making some much needed cash I spent loads on hot drink and food instead! Saturday was the big day, the sun came out and I was delighted to be rushed off my feet. I had such great reactions from customers to my stall, and near the end of the day started running low on some stock which I really didn't expect. It was quite a relief to be so busy after so many lean weeks, and as I've had to spend a lot on new equipment for the stall too. Sunday wasn't as busy for me, there were a few minor problems, but not enough to mar an incredible start to trading at Greenwich. It's quite an effort to haul all the display equipment as well as enough glass, I seem to be breaking a trolley every week! The new heavy duty one I got Thursday broke on Sunday morning, so I'll be glad when I can get storage space near the market. I will certainly be back next weekend, and as many after that as I can manage. 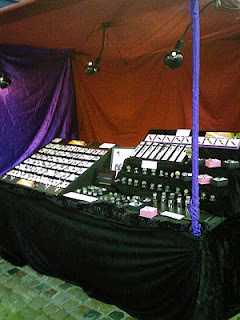 In the meantime I've still got some tweeks to do to the stall, plus I need to melt some glass! I've barely made any glass for the past two weeks as I've been so busy trimming material and making display stands, so I want to make lots of new stuff for this weekend. I will be a little slack on posting new items on line until I get settled in, but once I have I will start filling my Etsy and Folksy shops with new glass! Well done, that's great. We are sometimes up in London at the weekend amd will seek you out if we are there. Good luck with sales.